Flying slow and keeping low, like a lizard, this helicopter flight from Ayers Rock offers exceptional viewing opportunities of Australia's Red Center. 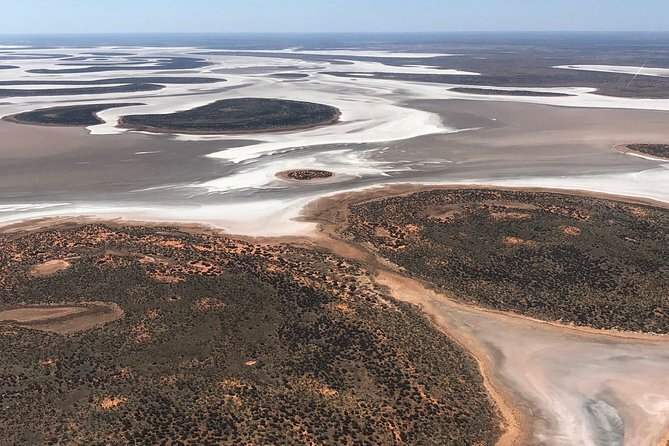 See the unspoiled beauty of the Northern Territory desert as you take in the vast splendor of Lake Amadeus on this extended helicopter flight. Look for camels roaming where the salt lake meets the desert sands, and then marvel at the spectacle of Uluru (Ayers Rock) and Kata Tjuta (The Olgas). This 55-minute helicopter flight takes in amazing sites including Lake Amadeus, the largest salt lake in the Northern Territory and the World Heritage listed Uluru and Kata Tjuta. With pick and drop off at your Ayers Rock Resort accommodation included, this extended helicopter tour is an absolute must! I had originally booked in for a longer trip, but, I was only 1 and they needed 2. Chris and Ian tried everything in their power to make it happen for me, but to no avail. So I decided on the 30 min Uluru and Kata Tjuta trip and I was not disappointed!!!!!! It was absolutely fantastic!!!!!! I was fortunate to be seated next to Ian, the Pilot, and had the most amazing view. You could see for miles and Ian filled us in with lot's of really interesting info, as we flew across the land. I can honestly say, it was the most unreal experience and well worth the money. To see Uluru and Kata Tjuta from the air, was quite different to walking around them. Highly recommend!!!!! We had a perfect day for our helicopter tour, beautiful sunny day and very little wind. Our pilot was very professional and knowledgeable and you got a much better perspective of the area seeing it from above, especially around Kata Tjuta. Would highly recommend this tour. Different perspective to walking around Uluru and Kata Tjuta. Really could appreciate their enormity..particularly the Olga's.Had been recommended by others to do this and was absolutely impressed and pleased I did it. This was an amazing experience, our group to a person were in awe of the sights of lake Armadeus, the Olga's and Ayres Rock, our pilot was amazing in his commitment to our safety and his knowledge Of the lakes Olga's and Ayres rock. This is a tour I would highly recommend to any visitors Ayres rock. The only way to see the massive scale of the outback , and watch the sun rise over the red centre. Wow!! Absolutely excellent. Just how you organised perfect weather and flying conditions is beyond me. A highlight of our trip. Lake Amadeus was something everyone should see. A great way to see Uluru and surrounds. The helicopter ride in itself was an exciting, fun thing to do, very stable even on the windy day we travelled. The views were superb and the height allowed us to have a really amazing perspective of how huge the rocky monoliths are. A spectacular way to start your time at Ayers Rock. The only negative was that it was a little hard to hear the pilot's narrative, however, he was excellent and made us feel very welcome and safe. My husband would give this a 5 and I would give it a 1, so we settled on a 3. The reason for the difference of opinion? Where we were seated. I was stuck...and I mean STUCK in the middle of the second row. When I looked forward, I saw a black column with a fire extinguisher on its side, completely blocking any forward vision and on either side were other passengers who, without meaning to, blocked my views with their persons and their cameras. The seat also had a metal frame over my head that forced me to slouch down (I am 5'9") in order that the headphones could be worn to hear Morgan, the pilot's, commentary. It was a miserable and uncomfortable 55 minutes That space should not be sold as a seat. Now, my husband was in the front, next to the pilot so he had a lot of space and was able to take good pictures. I saw the sights through these photos after the flight. The views I missed are amazing.